The first week of February includes a very important annual date – the 6th February is international Zero Tolerance for Female Genital Mutilation Day, a day for us all to renew the declaration made in 2003 by the First Lady of Nigeria, as leader of the Inter-African Committee on Harmful Traditional Practices, that we will make FGM history across the globe, and soon. 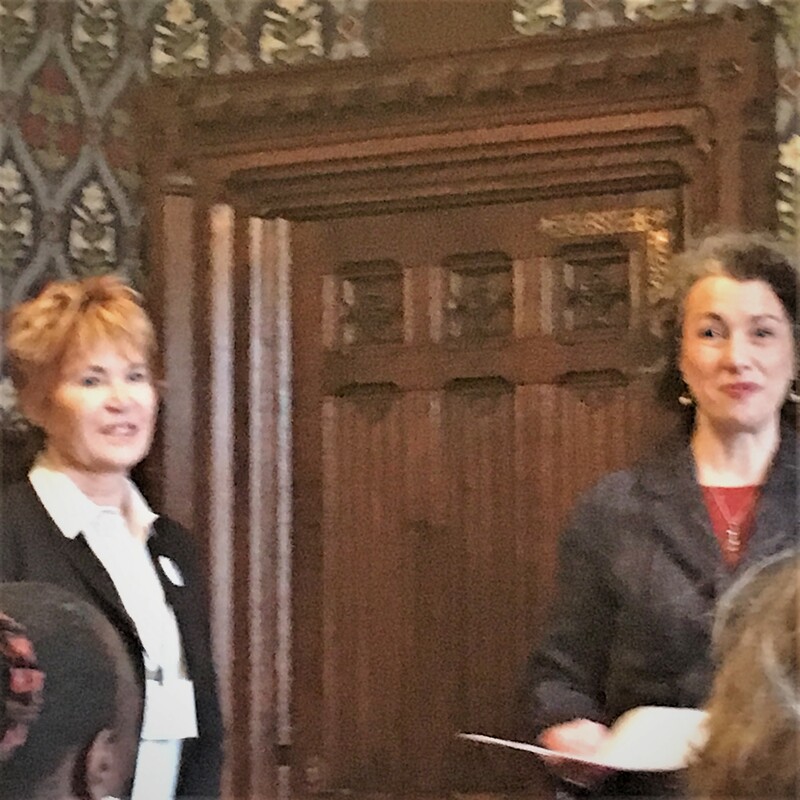 It was very fitting therefore that Sarah Champion MP secured an afternoon event at the House of Commons (Westminster) to consider FGM in the UK on the day after Zero Tolerance Day. The first part of the afternoon was taken up with a showing of the BBC Storyville version, introduced by BBC editor Mandy Chang, of Giselle Portenier‘s film In The Name Of Your Daughter, now renamed Defying The Cutting Season for its anticipated BBC showing in March 2019. As I expected, Giselle’s film, and her report of what has happened since, had a profound effect on those in the room. At this stage in campaigns to rid the world of FGM we can expect set-backs as well as hard-earned successes; but her admirable openness and honesty served us well in setting the tone of the discussion which followed. FGM has been a crime in Canada ever since 1997, but sadly, most political and policy leaders in Canada have not so far actively acknowledged that FGM (and other related practices) are a problem in Canada as well as almost everywhere in the world. But the likelihood that no women and girls in Canada require protection from, or support as a result of, FGM is pretty well zero. FGM happens in neighbouring US states, and right across Europe. That it seems not to happen in Canada is probably because it has not been looked for, rather than because it isn’t there. Canada Step Up And End Female Genital Mutilation. Online campaigns across the UK, Europe and the USA have had significant impact on the political will to eradicate FGM. The hope must be that, with global support, this new campaign will deliver a similar shift towards meaningful action on FGM in Canada. General practitioners (GPs) have until recently mostly taken a back seat in work around FGM in Britain: in 2016 the FGM lead for the Royal College of General Practitioners said in a Home Affairs Select Committee round table discussion on FGM that the college did not have any figures on FGM reporting (Q.18), and the RCGP written evidence for the 2014 Home Affairs inquiry claimed (Section 15) that there was no data on the short or longer term impacts of FGM on those who undergo it. Progress has been made since then, but still FGM remains too often under the radar in general practice. Whilst there is agreement by many GPs that they have a legal and ethical duty to support and protect vulnerable women and girls, some are uncomfortable with the obligation to report cases of FGM (whether anonymously for statistical analysis, or personally in the case of an under-18 year old). Nor, like some other clinicians, do all GPs find the reporting system for safeguarding minors satisfactory. Dr Phoebe Abe-Okwonga, a GP who every week provides two free, open-to-all FGM clinics, reminds us however that FGM is a serious and chronic condition, often requiring both physical and mental health remediation. It should therefore be documented by GPs contracted into the NHS in the same way as other chronic conditions such as dementia, diabetes or hypertension; and GPs should be paid an allowance such as the one they receive for having patients on their lists with other chronic health problems. This system, Dr Abe-Okwonga tells us, would encourage GPs actively to look out for and treat women and girls with FGM, as well as preventing much future ill-health in affected patients. And it would also help in ascertaining what NHS and other care beyond the GP surgery is required, whilst facilitating through engagement clinical vigilance in the prevention of harm to FGM survivors’ daughter and other young female relatives. The health economics analysis of Phoebe Abe-Okwonga’s proposal has yet to be done, but the direction of travel is clear: the more health and related FGM conditions are well managed, the less the costs to both patients and the state will be over time. … which leads us to our third issue…. The (UK) National FGM Centre, a partnership between the children’s charity Barnardo’s and the Local Government Association, aims to bring FGM to an end in England and Wales by 2030. The work of the Centre is currently undergoing a second evaluation (the first was in 2017). Questions to Government Ministers by Sarah Champion MP have revealed however that there are no plans for the Government to continue support for the Centre post-2020: after that date it is expected to be financially self-sustaining (presumably the expectation is that local authorities, themselves severely cash-strapped, will buy in consultancy and training). In the context of the (welcome) commitment of £50 million by the UK Government / DfID to end FGM in Africa by 2030 this decision seems odd. Community activists in Britain frequently say they feel ignored and undervalued. It is difficult to understand the rationale for a decision not to provide further state support for FGM eradication in England and Wales – especially at a time when any form of Brexit would damage that ambition anyway – whilst budgeting for it elsewhere. And here’s an irony: FGM is traditionally an economic activity – it is patriarchy incarnate, making women and girls chattels to be traded on markets to (some) men’s financial advantage. But modern economic markets, private business and commerce, cannot make FGM history. It is the state which as its essential, fundamental obligation must take responsibility for the most vulnerable of its citizens. There is still much to be learnt about how to stop FGM in the UK or anywhere else. As above in the context of GP services, prevention is always better than cure; and effective remediation is better than putting the problem aside. No (wo)man is an island. At present we don’t even know in any detail (the data on both incidence in the UK and country of origin is incomplete) the connections between FGM in traditional settings and countries, and FGM in modern western contexts such as the UK. Demanding adequate information about the inter-connections of British communities and traditionally practising locations is not a claim to prioritise the UK; it’s simply in everyone’s interest that we develop satisfactory evidence-based strategies to address the issues in Britain, wherever people have come from. To make FGM history the UK and other nations, and our governments on our behalf, must attend to FGM and other harmful practices on our own doorsteps as well as, equally importantly, everywhere else – North America, Africa, Europe or even further afield – across the globe. Many thanks to Sarah Champion MP for enabling such a wide-ranging event and follow-ups.